Hoisted from the Archives: Reply to Bhagwati: "I open my May/June  issue of Foreign Affairs to discover myself pilloried in an article by Jagdish Bhagwati between Paul Krugman and Roger C. Altman (excellent company to be in, by the way: much better than I am used to) as a banner-waving proponent of international capital mobility, guilty of "assum[ing] that free capital mobility is enormously beneficial while simultaneously failing to evaluate its crisis-prone downside." I rub my eyes in surprise. I had not thought of myself as a banner-waving proponent of international capital mobility. Last Month Over at Equitable Growth: The Federal Reserve Is Set to Raise Interest Rates Again for Probably All The Wrong Reasons: The meeting [last month] of the Federal Open Market Committee—the principal policymaking body of the U.S. Federal Reserve system—[was] overwhelmingly likely to raise the benchmark interest rate it controls, the Federal Funds rate. The rate, which governs short-term safe nominal bonds, is likely to go up by one-quarter of a percentage point, from the range of 1.75 percent to 2 percent per year to the range of 2 percent to 2.25 percent per year. That would make it a little more expensive to borrow and spend and a little more attractive to cut spending and save. Thus, there would be a little less spending in the economy, and so a few fewer jobs. Economic growth would be a little slower. The U.S. economy would be a little less resilient in the face of adverse shocks to resources or confidence that might generate a recession. These are all minuses—small minuses from a 25-basis-point increase in the Federal Funds rate, but minuses nonetheless. Tail risks. Can we afford right now to think about tail risks? Probably not: right now what were our tail risks have become head risks, and given them and our day jobs we are all fully absorbed. But if we are going to be spending even a little time thinking about tail risks, the big worry has to be that something happens to cause the Global North to stop investing, as it did in 2008-2009. Cast your minds back to ten years and two months ago. Back then people were patting themselves on the back; The United States had wound down from its over-the-top overcommitment to housing construction, and had done so without a recession. The Federal Reserve had handled the unpleasantness of mortage-firm, structured-product, and Bear-Stearns bankruptcy. In doing so the Federal Reserve had effectively guaranteed the unsecured debt of every systemically-important commercial and investment bank in and out of New York. The forecast—at least among those who were not close students of Hyman Minsky, an who had not paid attention to Paul Krugman's The Return of Depression Economics—was for at most a small recession, with the balance of risks such that the major risk to the economy—at least in the minds of the Federal Reserve's Open Market Committee—was an increase in core inflation. Talk: Does It Matter That the U.S. Economy Is Near Full Employment? A year of living dangerously for the world: It is now almost a year since the US subprime crisis went global. Many then hoped that the repricing of risk would be no more than a brief interruption.... Such hopes have been disappointed.... So where is the world economy now? And where might it go? Here are some preliminary answers to these questions. Following the pattern of the Bank of England, the United States's regional Federal Reserve Banks are quasi-governmental corporations with special charters, missions, and governance structures created by the central government. This provides them with an unusual degree of autonomy. For example, the Bank of England's charter strictly regulated the kinds of financial transactions it could undertake without going ultra vires. But the Bank of England did, repeatedly, engage in ultra vires actions. In fact, the Chancellor of the Exchequer would, not infrequently, write to the Governor of the Bank of England inviting him to and requesting that the Bank do so. Somehow, in the summer of 2008, the systemically-important American investment bank of Lehman Brothers entered into a state in which it was grossly insolvent, albeit still liquid. Somehow, in the summer of 2008, the Federal Reserve failed to either to develop a plan to guide the successful conservation and resolution of Lehman Brothers should it also become insolvent or to immediately shut it down before the insolvency of this systemically-important financial income became large enough to threaten the stability of the system as a whole. So when Lehman did hit the wall in the fall of 2008, Bernanke, Paulson, and Geithner dithered. That, I think, was the biggest policy mistake of the last decade. Anybody have any good reason why the U.S. prime-age employment-to-population ratio could not rise another 2%-points with a high-pressure economy? Robin Wigglesworth: Flat yield curve sends a grim message for investors in 2019: "investors are now starting quietly to fret that the US central bank may be on the brink of making a mistake, tightening monetary policy too aggressively in the face of a vulnerable global economy and still-quiescent inflationary forces. The Fed might get away with two hikes this year, but markets should worry about what might come in 2019..."
I think that this is a very important thing to remember. The Fed View—and the zero-marginal-product workers view—and a lot of other pessimistic views about the economy's non-inflationary speed limit for recovery and growth were totally, catastrophically wrong over the past decade. The people who strongly advocated for such views thus had a badly-flawed Vision of the Cosmic All. Thus I think there is no reason to put a weight higher than zero on their current views of how the world works—unless they have publicly and substantially done the work to mark their beliefs to market. 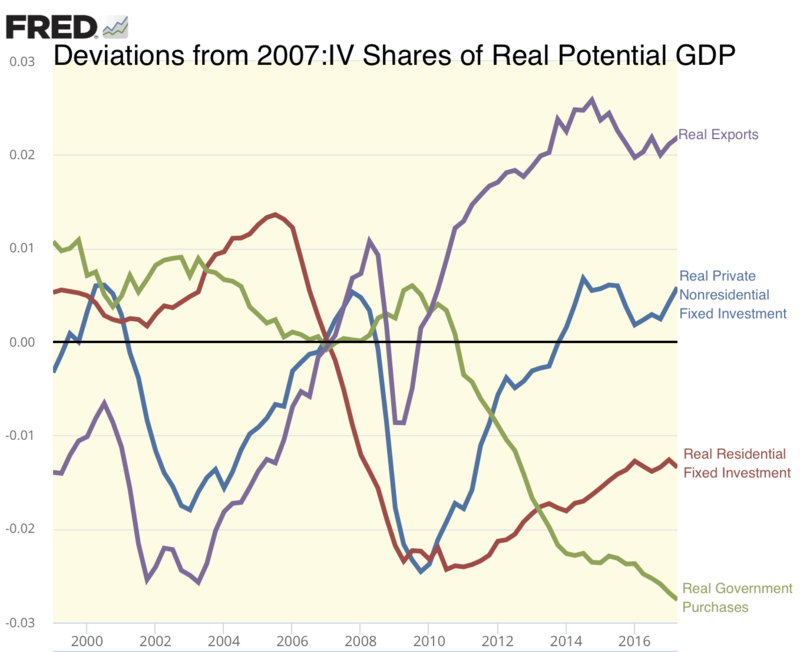 Certainly the Federal Reserve has not yet done so: Timothy B. Lee: "Every additional month of strong employment growth and weak wage growth makes people who said we were near full employment in 2014, 2015, 2016, and 2017 look wronger..."